Although its gaseous constituents are quite evenly mixed, the atmosphere is not physically uniform throughout. Variations in such elements as temperature and air pressure provide form and structure in what would otherwise be an amorphous medium. 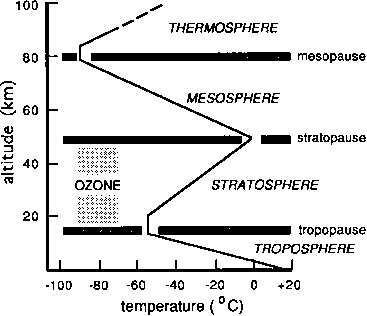 The commonly accepted delineation of the atmosphere into a series of layers, for example, is temperature based (see Figure 2.4). The lowest layer is the troposphere. It ranges in thickness from about 8 km at the poles to 16 km at the equator, mainly as a result of the difference in energy budgets at the two locations, and temperatures characteristically decrease with altitude at a rate of 6.5°C per kilometre within it—the tropospheric lapse rate. Temperatures at the upper edge of the troposphere average between -50 and -60°C, but in equatorial regions, where it reaches its greatest altitude, values may be as low as -80°C. The tropospheric lapse rate is, in fact, quite variable, particularly close to the surface. Such variations regularly produce instability in the system, and help to make the troposphere the most turbulent of the atmospheric layers. 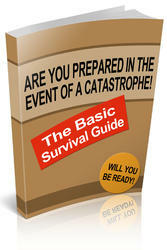 zone in which most weather systems develop, and run their course. These factors, together with the high level of human intervention in this part of the atmosphere, ensure that many of the global environmental problems of current concern—including acid rain, atmospheric turbidity and global warming—have their origins or reach their fullest extent in the troposphere. The tropopause marks the upper limit of the troposphere. Beyond it, in the stratosphere, isothermal conditions prevail; temperatures remain constant, at or about the value reached at the tropopause, up to an altitude of about 20 km. Above that level the temperature begins to rise again reaching a maximum some 50 km above the surface, at the stratopause, where temperatures close to or even slightly above 0°C are common. This is caused by the presence of ozone, which absorbs ultraviolet radiation from the sun, and warms the middle and upper levels of the stratosphere, creating a temperature inversion. The combination of that inversion with the isothermal layer in the lower stratosphere creates very stable conditions, and the stratosphere has none of the turbulence associated with the troposphere. This has important implications for the environment. Any foreign material introduced into the stratosphere tends to persist there much longer than it would if it had remained below the tropopause. Environmental problems such as ozone depletion and atmospheric turbidity are aggravated by this situation. Much of the impact of nuclear winter would result from the penetration of the tropopause by the original explosions, and the consequent introduction of large volumes of pollutants into the stratosphere. Temperatures again decrease with height above the stratopause and into the mesosphere, falling as low as -100°C at the mesopause, some 80 km above the surface. The thermosphere stretches above this altitude, with no obvious outer limit. In this layer, temperatures may exceed 1,000°C, but such values are not directly comparable to temperatures in the stratosphere and troposphere, because of the rarified nature of the atmosphere at very high altitudes. Knowledge of the nature of the thermosphere, and its internal processes, is far from complete, and linkages between the upper and lower layers of the atmosphere remain speculative. For the climatologist and environmentalist the most important structural elements of the atmosphere are the troposphere and stratosphere. 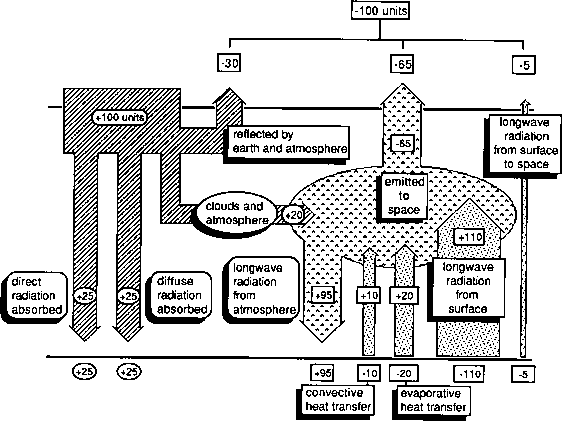 The main conversion and transfer of energy in the earth/atmosphere system takes place within these two layers of the lower atmosphere, and interference with the mechanisms involved has contributed to the creation and intensification of current problems in the atmospheric environment. Virtually all of the earth's energy is received from the sun in the form of short-wave solar radiation, and balancing this inflow is an equivalent amount of energy returned to space as long-wave terrestrial radiation. The concept is a useful one, but it applies only to the earth as a whole, over an extended time scale of several years; it is not applicable to any specific area over a short period of time. 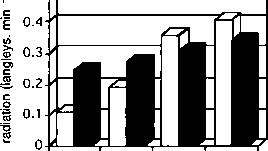 This balance between incoming and outgoing radiation is referred to as the earth's energy budget. The earth intercepts only a small proportion of the total energy given out by the sun— perhaps as little as one five-billionth (Critchfield 1983)—and not all of that reaches the earth's surface. The estimates differ in detail, but it is generally accepted that only about 50 per cent of the solar radiation arriving at the outer edge of the atmosphere is absorbed at the surface (Lutgens and Tarbuck 1982). That proportion is split almost equally between direct solar radiation and diffuse radiation, which has been scattered by water vapour, dust and other aerosols in its passage through the atmosphere (see Figure 2.5). Of the other 50 per cent, some 30 per cent returns to space as a result of reflection from the land and sea, reflection from clouds or scattering by atmospheric aerosols. [H incoming radiation M outgoing radiation necessary to allow the various atmospheric and terrestrial processes to function. The energy balance of the earth/atmosphere system is subject to stress from both natural and anthropogenic sources. Any factor capable of disturbing that balance is called a radiative forcing agent (Shine et al. 1990). In the past, the most common sources of forcing were natural and involved changes in such elements as solar radiation, the planetary albedo and atmospheric aerosol concentrations, which individually and in combination altered the flow of energy into and out of the system. These natural forcing agents, continue to disrupt the balance, but current concern is with anthropogenic forcing agents and the climate change that they are likely to produce. The depletion of the ozone layer resulting from human interference disturbs the balance by allowing additional radiation to reach the surface, and changes in atmospheric turbidity disrupt both incoming and outgoing radiation. 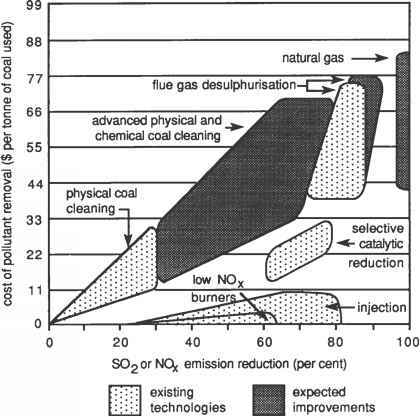 In the immediate future, however, the greatest change in radiative forcing is expected to come about as a result of the rising levels of greenhouse gases (see Table 2.2). It is estimated that their effect on the radiative balance of the earth radiative forcing agent, natural or anthropogenic (Shine et al. 1990). The concept of balance in the earth's heat budget is a useful one, but it provides only a global picture, and cannot be applied to specific areas. There is a definite latitudinal imbalance in the budget. Annually, the equator receives about five times the amount of solar radiation reaching the poles, and those areas equatorwards of 35 degrees of latitude receive more energy than is returned to space (Figure 2.6). The excess of outgoing radiation over incoming, poleward of 35 degrees of latitude, creates a radiation deficit in higher latitudes (Trewartha and Horn 1980). In theory, such an imbalance could lead to higher latitudes becoming infinitely colder and equatorial latitudes infinitely warmer. In reality, as soon as the latitudinal differences develop, they initiate circulation patterns in the atmosphere and in the oceans, which combine to transfer heat from the tropics towards the poles, and in so doing serve to counteract the imbalance. Where is the tropopause stratopause and mesopause located?